The first thing that good reporters are taught in journalism school is that it is absolutely essential to prioritize and organize the information that you are about to impart to your audience. 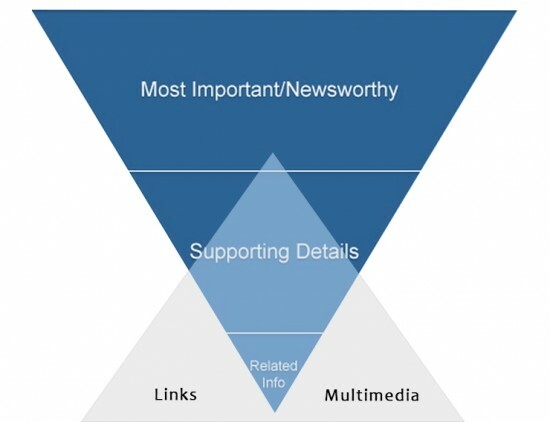 Generations of reporters have learned how to use a simple mental visual technique known as “The Inverted Pyramid” to reach out and grab the audience, and then hook them into reading the rest of their content. I’ve updated this newsroom classic to cover the changes to storytelling that have been brought on by the internet. As you can see in the illustration below, that means putting the most important information at the top of your story and then adding supporting and related information after that. To update the Inverted Pyramid, I added the second, smaller pyramid to the bottom of this image, representing our ability to add links and multimedia to a written story to broaden the base for those who want to learn more. That last point is not new. Many people say you should write shorter on the web because people don’t read online. I disagree. Some people read a lot, long form journalism is making a come back, but most of us skim text whether we read it on paper or online. That’s why the Inverted Pyramid is so important — online and off. Do you have what it takes to be a Content Strategist?